A sure sign of spring and summer are the skin rashes caused by exposure to poison ivy, oak, and sumac. These three native American weeds are a common cause of allergic reactions in millions of people each year. Contact with the urushiolan oily, toxic, irritating chemical found in these plantstriggers a skin reaction with intense itching known as contact dermatitis. The rashes of poison ivy, oak, and sumac appear as raised lines of redness with tiny blisters that eventually open and dry up. There are a wide variety of over-the-counter skin products available to help relieve the itching of poison ivy rash, and in severe cases of inflammation, oral corticosteroids are often prescribed. Protective clothing will help prevent the development of urushiol reactions by blocking direct contact with the plants. Urushiol can stick to garden tools, pets, and other objects and remain a source of outbreaks for years. If you suspect you have come in contact with poison ivy or a related poisonous plant, a thorough cleaning within 10 minutes of contact helps to remove the urushiol oils before they can penetrate the skin and cause contact dermatitis. Treatment helps relieve symptoms of poison ivy but does not shorten the duration of the rash. For severe cases, corticosteroids are used. Poison ivy and oak usually have a group of three leaflets on the same small stem, which branch off from a larger main stem. Either of these poisonous weeds can grow as a freestanding shrub or as a trailing vine. Poison sumac has seven to 13 smooth-edged leaflets along the same stem, and it grows as a shrub. Learning to recognize these plants is the first step to avoiding a skin reaction. How the Rash Spreads: Poison ivy, oak, and sumac are found almost everywhere in the United States. These plants all contain urushiol, the irritating chemical responsible for the itchy skin reaction. The urushiol is actually inside the stems, leaves, and roots of the plant; these weeds are very fragile, and the wind or animals brushing against them often break leaves or stems. Urushiol is easily spread. Most animals are not sensitive to this irritating chemical, but most humans (about 85%) will develop a skin reaction. This skin reaction can occur even without direct contact with the plants. Contact with objects that have urushiol on them, such as garden gloves, tools, and pets, is one way to become infected. One of the most dangerous exposures to urushiol oils occurs when the urushiol in smoke is inhaled from a poisonous plant that is burning. The Irritating Oils Must Penetrate the Skin: The reaction to urushiol occurs only if the chemical penetrates the skin, so areas of the body with thicker skin, such as the palms or soles, are usually not affected. If contact with a poisonous plant is recognized and the area is thoroughly washed within 10 minutes, the rash is not likely to be as severe or spread since the oils have not yet penetrated the skin. Some experts recommend cleaning the skin with rubbing alcohol first, then water, and finally soap and water. Using soap initially may actually move the urushiol around, spreading the reaction. Clothing, shoes, or equipment that have come into contact with these plants should also be washed with a soap or detergent, since urushiol can remain active from one season to the next. If a reaction does occur, it usually appears within several hours to days after contact. The more sensitized a person is to the oils, the quicker the reaction appears. Most people are sensitized after several exposures; others can react after just one exposure. A small percentage of the population is actually resistant to the allergic reaction. 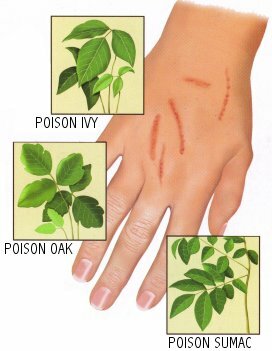 Poison Ivy Is Not Contagious: The rash caused by urushiol oils begins with lines or streaks of redness and swelling, followed by the formation of tiny fluid-filled blisters and severe itching. Eventually, these blisters break and crust over as the healing continues. The entire process, from contact with the plant oils to complete healing of the rash, usually lasts seven to 21 days. Contrary to the belief of many, the blisters that form on a rash do not contain urushiol, so the rash cannot be spread by scratching these blisters, nor is it contagious from person to person. Although it may seem that scratching the rash causes it to spread to other areas of the skin, the spread is probably due to oil under the fingernails, a new exposure to a contaminated tool or glove, or a different rate of urushiol absorption in different parts of the body. Over-the-counter Remedies: For mild cases, your pharmacist can recommend a nonprescription product. The ingredients most often found in these products include drying agents, anti-inflammatory and analgesic agents, and skin protectants. These medications dry the blisters, relieve itching, swelling, and pain, and speed healing. They are designed for short-term use and should not be applied for more than seven days. For severe reactions in which the blisters have already formed, or those covering a large part of the body, oral corticosteroid drugs are often necessary. These should be taken for the period of time prescribed by your doctor, usually two to three weeks; if they are stopped earlier, the rash can return. Be sure to ask your pharmacist to help you select the right nonprescription medication to treat these skin rashes.